A new report on ocean sciences at the National Science Foundation (NSF) recommends a major course correction to adjust an imbalance between funding for core science research and escalating infrastructure costs. The report also identifies eight priority science questions as the key topics in ocean science for the next decade. 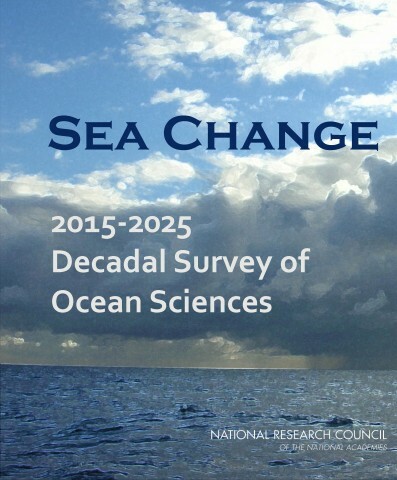 Sea Change: 2015-2025 Decadal Survey of Ocean Sciences, issued by the U.S. National Research Council (NRC) on 23 January, states that ocean infrastructure operations and maintenance costs need to be cut back because they have outstripped funding for core research programs. Core programs within the Division of Ocean Sciences (OCE) of NSF’s Directorate for Geosciences received 62% of the division’s funding in 2000 but just 46% in 2014. Over the past decade, OCE’s budget has declined by more than 10% when adjusted for inflation, the report notes. NSF is the principal U.S. federal agency funding basic research in the ocean sciences. With a mandate that assumes a flat OCE budget over the next decade, the NRC committee recommends reallocating at least 20%—about $40 million in 2014 dollars—of the major infrastructure operations and maintenance budget to core sciences and OCE’s Oceanographic Technology and Interdisciplinary Coordination (OTIC) program. Major infrastructure programs should comprise no more than 40-50% of OCE’s total annual program budget, according to the report, if budgets remain flat or include only inflationary increases. “The only way to recover funding for core science and OTIC is to reduce the amount of money spent on infrastructure,” the report states. “The only way to recover funding for core science and OTIC is to reduce the amount of money spent on infrastructure,” the report states. “Such reductions are not easy and will cause disruptions for parts of the ocean science community.” There should be an immediate 10% reduction in major infrastructure costs in OCE’s next budget and an additional 10-20% decrease over the following 5 years, according to the report. Reconfiguring the budget would mean reducing funding for some major infrastructure programs. These include the International Ocean Discovery Program (IODP), which undertakes scientific ocean drilling; the Ocean Observatories Initiative (OOI), which has not yet entered full operation; and the University-National Oceanographic Laboratory System (UNOLS) academic research fleet. The report recommends that the initial 10% cost reduction should be “weighted”—rather than across the board—to include a 20% reduction to OOI, 10% to IODP, and 5% to the fleet, based in large part on how these programs align with priority research questions. “The strongest match between current infrastructure and the decadal science priorities is the academic research fleet,” the report states. While the report recognizes earlier efforts by IODP to address budget concerns, it notes that “NSF has the ability to renegotiate its contribution to the IODP consortium and is strongly urged to pursue a more cost-effective partnership.” According to the report, OOI would receive the largest initial percentage reduction because “fewer of its components align strongly with the science priorities,” among other reasons. To achieve infrastructure program reductions, the report recommends specific cost-cutting options and encourages partnership opportunities with federal agencies, international programs, and other sectors. The report outlines eight broad priority science questions “with the highest potential payoff” for the coming decade. The questions, which the report notes each represent an integrative and strategic research area, are ordered spatially from ocean surface to seafloor. The questions include: What are the rates, mechanisms, impacts, and geographic variability of sea level change? And, what is the geophysical, chemical, and biological character of the subseafloor environment? The report outlines eight broad priority science questions “with the highest potential payoff” for the coming decade. Additional questions focus on the coastal and estuarine ocean and ecosystems; the relationship between biogeochemical and physical processes and today’s climate and its variability; the role of biodiversity in the resilience of marine ecosystems; and how to improve the ability to forecast geohazards, among other topics. The committee applied four criteria to determine top priorities: transformative research potential, societal impact, readiness, and partnership potential. 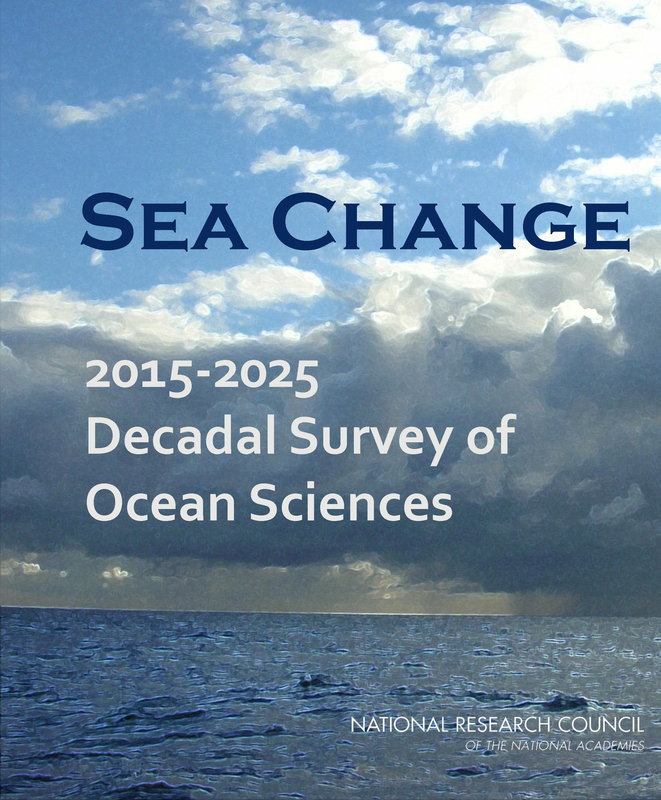 The decadal survey addressed two broad challenges, according to Pomponi, research professor and executive director of the National Oceanic and Atmospheric Administration’s Cooperative Institute for Ocean Exploration, Research, and Technology at Harbor Branch Oceanographic Institute, Florida Atlantic University, Fort Pierce. The first challenge was to identify important research questions. “The second challenge was to figure out how we could implement those [priorities], given the fact that the budget has flip-flopped in the last year or so,” with more money currently going to infrastructure rather than science. “We need to restore a balance of funding between ocean science infrastructure and the ocean science research. And we need to take immediate action to get that plan in place. And then, ocean sciences needs to have a long-term plan to maintain that balance to ensure a robust ocean science enterprise,” she said. Richard Murray, OCE’s new division director who started on 12 January, told Eos, “We hear loud and clear the sense of urgency” expressed in the report. The National Research Council issued this ocean science report on 23 January. OOI Program Advisory Committee chairman William Boicourt told Eos that the report’s recommendations are “measured, careful, and constructive.” “I don’t agree completely with [the committee], but I thought they did a good job of laying out the situation.” Boicourt, a professor at the University of Maryland’s Center for Environmental Science, said the overall decline in ocean science funding is “the number one bleak aspect” of the report. “It’s unfortunate this budget crunch has come at a time just as OOI is starting out. The worry is that if they cut operations and maintenance that the data that will define the success of this program won’t be available in a way that will allow good science to happen,” he said. Boicourt said funding cuts should be more evenly distributed between OOI and IODP. He also said OOI is more relevant to the eight priority science questions than the report depicts. He added, though, that if a reduction in funding to OOI is required, the report’s suggested cuts of two OOI southern global stations would be a way to trim costs. “If we are going to re-scope [OOI], those are the ones that are going to have to go,” he said. “The capabilities of the IODP and the JOIDES Resolution provide the only capability in the international science community to access sediments and rocks at deep ocean levels,” he said. “Addressing the survey’s priorities without these capabilities would be like asking astronomers to understand the cosmos by using telescopes that cannot see beyond our solar system. Nevertheless, any reductions to the program as suggested in the survey would provide significant challenges. It is not clear from my initial read that the committee recognized the total savings to [NSF] that have been implemented” for IODP, Clement said. Randall Luthi, president of the National Ocean Industries Association, told Eos that the report outlines important fiscal challenges for the ocean sciences. “Creative solutions are needed and one clear path is to increase partnerships with the offshore energy industry,” he said. Citation: Showstack, R. (2015), Study stresses ocean science priorities and budget rebalance Eos, 96, doi:10.1029/2015EO022841. Published on 28 January 2015.